In l981 a horrible typhoon called typhoon Bising struck the fishing islands in the middle of the night. I was assigned in another town when this happened. It was only from the radio I heard that my home island, Hingotanan, was badly hit by the typhoon, leaving a number of dead bodies on the seas. That time I was preparing myself to go back to my university, open to be groomed as a faculty... Hearing the news, I was determined to go back to my home island, forgetting any plans in life but resolved only to return to my home people, to be in the island where I was born. The following met my eyes: coconut trees tumbling down over fragile houses, destroyed boats carried higher from the shorelines as being whipped or pushed by the giant waves, lamenting people on the shore waiting for rescue operations, hoping to bring to shore live or dead bodies of the victims. I joined in the wailing crowd everytime a boat reached the shore to deliver a dead body or more which to others were difficult to identify. I stood in front of a woman who, upon seeing one of the floating corpses carried by one of the boats, waded into the waters and embraced the bloating dead body of what she claimed her young son. She could only identify him by the colour of the dress, still attached to the stinching and rotting body of the dead boy. That sight seemed to slice my heart, which I never can forget in my life. I left the crying crowd and started to get a pencil and paper and roamed around the island, asking people about their loss and the names of their dead loved ones. I asked the young people in the church to join in the investigation. In that evening, I wrote a project proposal to the National Council of Churches in the Philippines, endorsed by Bishop Apura, and which was then forwarded to the World Council of Churches in Geneva. It was a proposal, a plea for help to rehabilitate the island. The written proposal got the immediate response. Out of the funds sent by WWC, which at the time was 30, ooo pesos (equivalent to about 4 thousand kroner), the church committee was able to buy housing materials-- nipa shingles, nails, wood, bamboos and food items which were distributed to the local people. There was time for rebuilding houses and for cleaning up the surroundings. While the adults did their practical work, the children were also attended to. There was feeding program for the children and informal teaching and play activities, while the school was still closed after the days of the calamity. There was also a need to talk with the mourning families. Pastors and women church workers were invited to visit the island to talk with those who lost their loved ones. 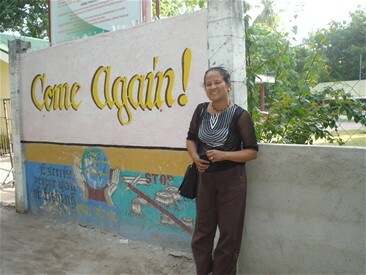 The local churches in the mainland of Bohol, through the leadership of Rev. Exiquel and Rev. Nemesio Puracan, also provided boatloads of food to the island-- sweet potatoes, bananas, fruits and vegetables. It was amazing how poor people in the far off local communities, who heard about the calamity in Hingotanan responded by giving a bit of their food which made up boatloads of deliverance of help to the island. The Development Ministry to the Islands started out of this venture as an informal teaching program to care for the children while the adults were busy in the program for the physical rehabilitation. It started as a community program with volunteers. And in 1983 the program which started as rehabilitation program, got its name Development Ministry to the Islands with the Day Care Center as important part of the whole program, to take care of the small children. The Development Ministry to the Islands or DMI tried to reach out surrounding fishing islands with the community newsletter, Bidlisiw, and arranged seminars and meetings in Hingotanan, touching issues on parenting, human rights, health and family values. The seminars invited men and women in and outside the island, and enabled the local people to come together for common sharing and discussion and singing of common songs. 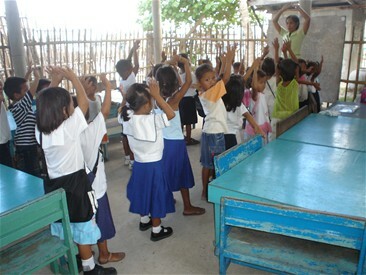 Vacation classes were also opened in the fishing islands, right after the closing exercises of DMI`s Day Care Center. 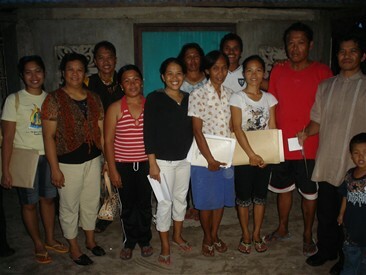 Employed personnels and some young people in the church held vacation classes in designated neighbouring físhing islands. The program ran for one week for every island. The program took care of food and travel expenses of the volunteers. This tradition continues until now. In April starts the vacation classes in neighboring fishing islands, teaching children songs and poems, games and stories and ending the one week teaching with a program for community celebration where the local people are invited to see on stage what their children can through songs, drama and stories. With this involvement, it became necessary for DMI to have a boat of its own for the travel of the volunteers and personnels. At some other times, it was necessary to have a boat that could fetch guests of the program from the town and also to secure goods and materials for the center. The project got support from an Aid organization in Holland which lasted for more than two years. And the project stood again with the insecurity of its financial support. Personnels, for sometime, wondered how long they could work, given the great uncertainty. Local contribution of parents was encouraged but even the parents`counterpart, could not at all, support the salary of the employed personnels. And then a local congregation in Germany, the Bierstadst Congregation, through the chairman of the church council, Erna Peltzer, came to offer a helping hand. This is the church congregation that has continued to maintain its partnership with DMI for a period of twenty years. The partnership has witnessed to the visit of Erna and Hans Peltzer to the island, the coming in of young German volunteers by the names of Marco, Christina and two others for a period of some months and the church`s economic sponsorship to the annual budget of the program. At present, DMI is directly placed under the umbrella of the United Church of Christ in the Philippines, Bohol Conference, Incorporated. At present DMI has got two centers. One is in Hingotanan Island and the other is in Maomaowan Island. 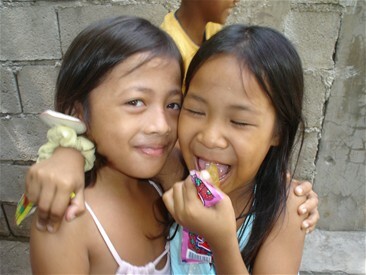 Hingotanan DMI center has an enrollment of 102 children this school year while that in Maomaowan has 20 children. DMI Center in Hingotanan is located in Sitio Luyo. It is very near the United Church of Christ in the Philippines. At times the center is also used for the Sunday School class of the church. The Center is used for parents`meetings, and as recreational center for the community children during week-ends. DMI also celebrates Children`s Day in the month of October. Children`s Day is a special event open to the whole community. It starts with the children`s parade throughout the island and ends with the program of songs, dances,games,speeches and common meal at the center.The celebration often draws visitors from the Bohol Annual Conference, UCCP and from the surrounding islands. 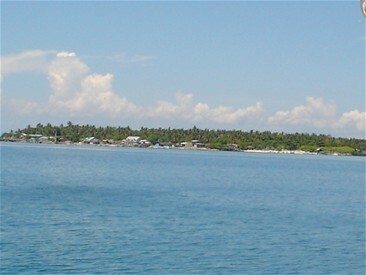 Hingotanan Island in the province of Bohol, which can be stormed by typhoons. People have to rebuild their houses and means of livelihood at every strike of natural calamity. The Olesen family after development work in Nepal moved to the Philippines under the sponsorship of the Danish Santal Mission, which at present is called Dan Mission. Jens Christian Olesen as an engineer was meant to work together with the Lutheran Church in the Philippines for development work. The family was stationed in Cebu City with formal relationship to the Lutheran Church in the Philippines. 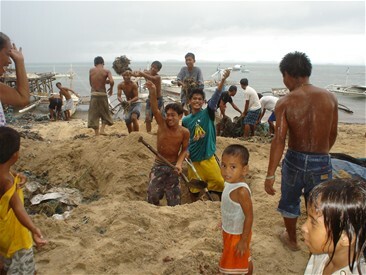 The work relationship extended a permission to work for the development in a fishing island like Hingotanan. It was during this period that HIPEMUCO as a cooperative organization was born. HIPEMUCO stands for Hingotanan People`s Multi-Purpose Cooperative. After some community meetings and talks of common vision for the fishing island, the cooperative was born. It got economic support from the Folkekirkens Nødhjælp from Denmark. The program ran with the construction of the big boat, Juan 3. 16, and the putting up of the Cooperative Store which became a help to fight against the loan sharks and high racketing prices of the basic commodities.First of all, it intended to provide the daily needs of the local people at lower prices. HIPEMUCO was able to elect a board to run the program. There were also employed personnels to run the Cooperative Store. In the first three months, the cooperative store was being operated in the house of Elizabeth`s mother, until the cooperative was able to secure permission to rent the house of the Cabanes family who immigrated to USA.The site was strategic for the HIPEMUCO Cooperative Store because it was near the sea, close to the beach, easy for those who come from other fishing islands. The newly rented house had also a big water tank. The Cooperative Store which made available to the community housing materials like timber and cement and common goods in bulk at lower prices, brought about a revolution to the community. Many families were able to repair and construct new houses. New commercial initiatives took place.As the cooperative store allowed a loan for a sack of flour, there also came more and more small bakeries. Those who engaged in seaweeds farming could get their materials from the Cooperative Store, instead of taking a long way to town, which practically would need one day`s absence from the island. 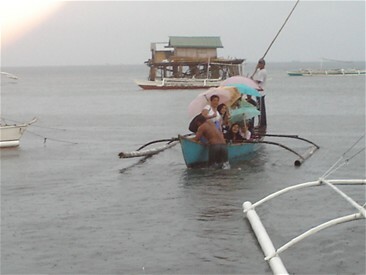 The newly constructed boat made the trip possible from the island to the province of Cebu. The boat Juan was a cargo and passenger boat. HIPEMUCO community meetings were often held at the Public School. These meetings often started with common singing and snacks. It gave place for questions, common discussion and suggestions. In another typhoon that hit the island, the boat Juan, suffered. Its outriggers were destroyed and after months of plying idle on the seashore, it came impossible to repair. HIPEMUCO as an organization still exists but not anymore active as before. The Cooperative Store is still operating and has a sale of three thousand pesos every day. The only employed personnel who receives salary is the seller. It is her who keeps the Store/shop operating everyday and she makes orders of goods from town. The piece of land owned by HIPEMUCO is a challenge for the members. Part of the children`s center, Development Ministry to the Islands-children from 4 to six years old. When the Olesens left the HIPEMUCO project in 1995, the construction of a cooperative store building was already begun. It was hoped that the newly constructed building would help the HIPEMUCO from the monthly rental of the Cabanes`family which housed the Cooperative Store. Since the cooperative store had a good turn-over, it was believed that the newly constructed building meant for the cooperative store would be completed out of the surplus income from the Cooperative Store. The building was already standing on a lot, which was bought by the Cooperative from the Catacutan family. The building had already the necessary posts, the floor and the roofing. But sad to note, that after ten years, the same building stood the same since the day the Olesens left the island. The unfinished building, for ten years, had stood as skeleton, without being touched. The Cooperative Store suffered out of the corruption of some employed personnels. The capital dwindled so that there was only little capital left to let the cooperative continue its operation. Elizabeth used to come home every two years and spent time visiting DMI and also HIPEMUCO. After four times of coming home, the same sight of the unfinished building met her eyes. Without much calculation during her last visit in July and August of 2006, Elizabeth decided to continue the construction out of the money she got from the sale of her paintings. As her ticket for the Philippines, this time, was shouldered by the Stairway Foundation, she then could use her own money for another cause. She talked with some of the standing officers of HIPEMUCO and asked for their idea. They said that it would be very good to save the standing building because the materials were still usable. Knowing that the cooperative Store, with its dwindling capital, would find it impossible to finish the construction of the building, Elizabeth ordered then the purchase of 100 sacks of cement, invited two personnels to make hollow blocks out of the cement, they were the same folks who constructed the well for the building, invited the young people of the church to clear the area, the whole lot which HIPEMUCO had bought, which was already surrounded by bushes, and requested two carpenters to start the construction of the building. Her money was not enough to shoulder the construction. When she came back to Denmark, she took time to exhibit more of her paintings and forwarded every bit amount for the project. The building was finished, not really completely, but quite habitable with walls and beds.The building was given to two purposés, the housing of the Cooperative Store and the lodging house of some students who come from the surrounding fishing islands. After years of operation in the big house of the Cabanes Family, HIPEMUCO could not anymore pay for the rent of the house. It became necessary that the Cooperative Store should move to another smaller house in the island which required lesser rent. The only employed personnel of the Cooperative Store was the seller. HIPEMUCO through the Cooperative Store continued to provide service to community, making available the basic needs like food and gasoline and materials for fishing and seaweeds farming, and some materials for the kitchen.At present, the Cooperative Store of HIPEMUCO is now housed in the newly constructed building. 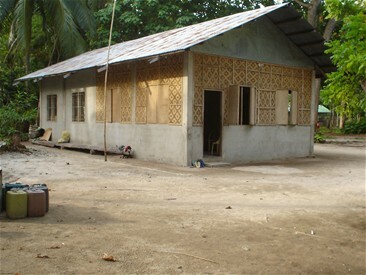 The other half of the newly saved building has been intended to receive students in the island. Many of the young people from the neighboring islands stay with families during school days. 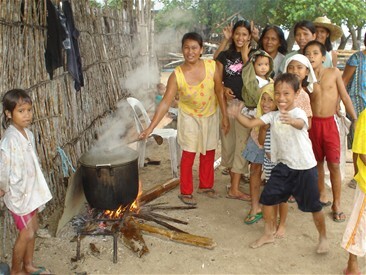 Because of the nuclear family tradition, the presence of many students belonging to the same family clan, can be a burden to the host family in the island. My old mother for example, had to receive 15 students in her home, just because she could not say no because these students were relatives and part of the family clan. Many families have the burden of receiving a number of students to stay with them from Monday to Friday. There is no dormitory in the island. I saw how the presence of many students in one family could be a burden to the host family that the idea of continuing the construction of the HIPEMUCO building was born. The building was blessed or inaguarated last October 2006 and in the same month the Cooperative Store of HIPEMUCO moved to the new building, while the invitation continues to invite students to make the building their lodging house during school days. The building is not complete yet. The church pastor considers contact with the students as part of church ministry.There is no update yet if the building is now occupied by students. But what is happening now is that the building is now hosting the operation of HIPEMUCO`s Cooperative Store although the building is not fully completed yet. The kitchen has to be built. The building requires a fence.The well has to be completed. Since water from the ground well is not really good for drinking because at summer time the water turns salty, it is hoped that a water tank can be built. The roof of the building can collect rain water. Rain water is commonly taken as good drinking water. A member also has suggested that the surrounding lot can be strategic for children`s recreational or play facilities. There are many ideas, plans and dreams.But they require financial support. At the same time, I continue painting and exhibiting what I make out of my hands, and see that sales of my paintings continue to feed into the completion of this project. I only hope that the standing board will begin to lay out guidelines on the use of the building and the piece of land, where the building is standing on, and that they can plan out to reactivate cooperative participation. Cooperative Building, half of it is for the cooperative store and half of it as place for students. The building is near the school. The area is big enough to have recreational facilities for children and youth. After many years of seaweeds farming, the Hingotanan beach is left with a heap of garbage of straws and plastics.The white beach is gone, and replaced with the blue colours of the plastic garbage as remains after every harvest of the seaweeds. Before I came, the people were very much affected by the recent typhoon that devastated their seaweeds farms, making it very difficult for them to secure seaweeds for replanting. Then the sinking of the ship, Princess of Star, added to the disaster. When I came, there were still news of some dead corpses being fished out from the seas. And the fishermen were also terribly affected by the accident. Many refused to eat fish. And of course, the fishermen missed the chance to earn cash from their catch. And added to these two sorrows, was the price hike of rice. Preparing for my visit, I thought that the best gift I could give to the people was rice. I succeeded in selling the postcard of one of my paintings entitled, A Refugee, which the Inter-Cultural Center in Copenhagen had published. Then out of the sale of the postcard which were distributed to my colleagues in school, friends in the church and neighbors, I was able to raise up about five thousand Danish crowns (kroner).Then a friend from Bornholm with her Second hand shop doubled the amount. The total amount enabled me to purchase 41 sacks of rice.Thirty one sacks were distributed in Hingotanan Island and 10 sacks in Maomaowan island. Each sack of rice contained 50 kilos. First, I thought it was just to distribute rice to the needy in the two fishing communities of Hingotanan and Maomaowan which house the two children`s centers, but then after some reflections and keeping on mind the awful dirt in the seashores and along the beach which one can easily notice when arriving the island, I thought it would be a good idea to ask the local people to work for the three kilos they could get. This was to let the people feel that rice they received was something they had worked for. I consulted other good friends in the island about the idea. They were delighted to hear. I could get a group from the church who were willing to give time and energy for the task. We said we gave three kilos to every family who was willing to join in the task of cleaning the beach. Then another in the group suggested that it would be good to add some cans of sardines/mackerel plus noodles. We all thought it was a good idea. The first day in Talibon town was spent to find out the prices of rice. And when I reached the Hingotanan island, I was fortunate that there was a General Assembly of the local people in the island which I was privileged to take part. I had the chance to tell over the microphone about my plan of rice distribution in exchange of cleaning the shores. It went perfectly well that one of the agenda in the meeting was a discussion on the environmental pollution in the island in the seas and then on the beach. I invited the people to come to me after the meeting so we could list down their names. But before that, I had already done some listing of the eligible people for the rice distribution: those who are really in dire need for rice, those who are willing to join in the task of cleaning the whole environment in the island and included in the target were also widows and the very old ones who would find it difficult to join in the Clean Drive. After the meeting, many people came to be listed up. A group spent an evening to make cards for every name on the list in order to make the distribution orderly. I called a general meeting at the DMI center at one noontime the following day. The local people came with the brooms and sacks, ready for cleaning up. I did a little orientation on the common task on hand. We identified areas to be cleaned up. There were two centers made as dumping sites. For every kilo one had to submit two sacks of garbage, which means that for three kilos of rice, expected were six sacks of garbage. It was an amazing site to see groups helping each other with their trailers, exciting to see the joys on their faces in the common task of reclaiming their shores and beach. Old, youth and children were involved and there were smiles on their faces, as if it was the first time in their lives to work together in cleaning up the whole island. Part of the organizing that was done was cooking in 6 areas where the local people did the cleaning. After cleaning up, and after delivering their sacks of garbage to one of the dumping sites, they could get their cards which they could present to the center in their area where the distribution of rice was done. One center in Tunga and one center in Luyo were the distribution centers. The distribution went very well. The card distribution was a big help so there was not anyone trying to fool us by coming two or three times to collect his /her share, a phenomenon which often can happen in a situation of distributing goods. It was amazing that there were those who did work more than what was expected, those who worked until the whole area was cleaned, enabling perhaps to deliver double or treble number of sacks of garbage than expected. The general cleaning was done for one afternoon that lasted until six to seven in the evening. But it was amazing to note that there were groups that continued to work cleaning up the shores the following days. Then the High School, Hingotanan National High School, took up the challenge, marking the culmination of their Health and Nutrition Month by letting their more than 500 children/students to clean up the surroundings around the school, the streets and the shorelines. It was amazing to talk with the principal, Jefford Canas, who claimed that the work started by the local people with rice as an incentive was a great inspiration that should continue. There were five hundred families in Hingotanan who received the bags of rice and there were 250 families in Maomaowan island that received also rice. In Maomaowan there was not a demand for the recipients to collect garbage since their beach is not that dirty as in Hingotanan. But in the common meeting with the parents of the DMI center in Maomaowan I did stress the need for children to be aware to have a clean shoreline and beach. The parents promised to have a day of clean up drive together with their children. I joined in the daily teaching activity and did some storytelling on environmental protection and integrity of creation. I did also painting with the kids, some of their drawings being posted in their classrooms and on the stage. Then I held two painting workshops to students of Hingotanan National High School. Sixty drawings and paintings on oil pastel are being now exhibited at the library of the High School plus about 15 paintings on canvass by oil and acryl are also added into the exhibition. For these students it was the first time in their life to use these materials in painting. I did encourage the principal in the school to invest a little sum so the school can acquire some painting materials, which I realized cost cheaply in the Philippine shops. to our seaweeds, fish and seashells. Then I was asked to give a common lecture on art to all second year students, ending the time with the task of letting their draw some images of good health. I spent time also for the church, preaching one Sunday at the invitation of the church pastor, and had two evenings in the church where I invited the young people to learn new songs, some songs in Danish and English which we commonly translated to our own Cebuano language. It was amazing to discover how the children and young people in the church could sing and remember the melodies so easily. It was also heartwarming to remember that the first evening for music was able to attract some Catholic leaders to join. They too, had the interest to learn new songs. These were happy nights of singing together and using the body to move according to the tempo and rhythms of the songs. Then there was a constant talk with people day in and day out, about their joys and problems. I came to talk with those who said that since the price hike of rice they or their families could only eat once or twice for a day. A Filipino has to eat three warm meals with rice each day. And to eat only once or twice must be a real tragedy. During my last week-end in the island I called for the meeting of the members of the cooperative organization, HIPEMUCO, the program which my husband started many years ago, of which existence is still felt in the island with the presence of the cooperative store which is now presently housed in the new cooperative building. They came and we had a meeting. I can write details on what transpired during the meeting, but what I only will underscore now is that many of them wish that HIPEMUCO will be able to sell rice that comes from the government. Let me explain. With the price hike of rice and gasoline, Gloria Arroyo, through her department of National Food Authority, has made it that the poor villages can be reached out by rice that comes from NFA which is sold at a lower price. A kilo of rice from a common shop in the island costs 45 pesos while rice purchased from NFA costs 25 to 27 pesos. But rice sold by NFA is limited. A citizen in the island is only allowed to buy three to five kilos. The seller of this kind of rice in the island is the rich man who wishes to earn from his capital, which means that he is charging already gain for every kilo. The members of HIPEMUCO believe that if HIPEMUCO as a cooperative organization will have the capital to purchase this kind of rice coming from the government, (NFA) then HIPEMUCO is still able to reduce the price while maintaining the capital. The request of the members of this organization, therefore, they have posed to me, is if they could be granted a capital of about ten thousand Danish crowns/kroner about one thousand euros to run the selling of rice that comes from NFA.HIPEMUCO as a registered cooperative organization in the Philippines is eligible to transact business with NFA, to secure rice to sell to the public. With this capital which should be a trust fund for the organization and as money for the continuing purchase of sacks of rice, to be sold to the local fishing community of Hingotanan and which should be open to other surrounding fishing islands, HIPEMUCO is then able to sell rice to the local people at a much cheaper cost. For now HIPEMUCO with its very small standing capital, is not able to deal with NFA in transacting greater number of sacks of rice. With one thousand EUROS, HIPEMUCO will be helped to sell 50 or more sacks of NFA rice, a revolving fund that should serve as Trust Fund, money which can recycle and cannot be lost because people will ever buy rice at a much cheaper price. This is the project I want to pursue. You who are able to read this report maybe able to respond by contributing or buying a postcard from me. Call me if you want to join in this effort and cause. A pose with the DMI committee, after a meeting in Hingotanan island, held at DMI center. Cooking for the Beach cleaners. A small boat to bring passengers to the big boat scheduled for Talibon. This is the same small boat used to bring passengers from the Talibon boat to the shore of Hingotanan Island. The main boat cannot dock the shore when the tide is low.